Sign up for TSN Fantasy Hockey! The many members of Leafs Nation believe this is the year that the Toronto Maple Leafs will win the Stanley Cup and Bodog agrees, installing them as 7/1 favourites heading into the new season to end their 52-year drought and win the title. 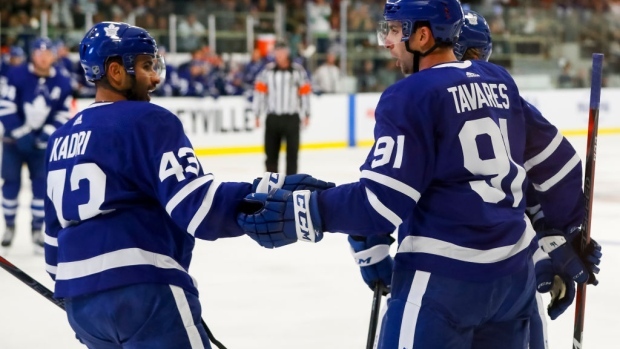 The Leafs made the biggest splash in the off-season when they signed free agent forward John Tavares, adding him to an already potent offensive attack that has allowed Toronto to climb to the top of the betting board. A Canadian team has not lifted the Stanley Cup since 1993, but two of the top three odds getters are north of the border, as the Winnipeg Jets are joint second favourites at 17/2. The Jets lost to the expansion Vegas Golden Knights in the Western Conference final after storming their way through the Minnesota Wild and Nashville Predators in last year’s playoffs. The last all-Canadian Stanley Cup final was in 1989 when the Calgary Flames beat the Montreal Canadiens. Despite losing much-celebrated general manager Steve Yzerman just three weeks ago, the Tampa Bay Lightning join the Jets as joint second favourite at 17/2. The Bolts were the number one seed in the Eastern Conference last season and advanced to the Conference final where they were eliminated in seven games by the eventual champion Washington Capitals. What of the defending champions? They enter the season with a new head coach as Todd Reirden takes over for Barry Trotz behind the bench. They are currently listed at 14/1, the eighth-highest team on the board. Directly behind them is the team they knocked off to capture the Stanley Cup, the Vegas Golden Knights, who will enter their second season with 15/1 odds to win the title, slightly better than the reported 500-to-1 odds they held prior to the 2017-18 campaign. In the middle of the pack, Connor McDavid’s Edmonton Oilers are 30/1 to go all the way, after finishing 17 points out of the playoffs last season. The Calgary Flames are one spot behind the Oilers, as they come in on 33/1 odds. The news is not as good for the other three Canadian franchises as they make up three of the last four places on the board. The Vancouver Canucks and Montreal Canadiens are both listed at 100/1 to win the Stanley Cup and the Ottawa Senators have the worst odds of the seven Canadian teams as they sit at 200/1, second worst in the league. At 250/1, the long shot entering the 2018/19 season are the Detroit Red Wings, who said goodbye to captain Henrik Zetterberg in the off-season as he retired due to a degenerative back condition.